"The Peach Tree and the Earthworm"
This worm story is called, "The Peach Tree and the Earthworm". Some folks get squeamish about worms. Especially if they have to touch them. Yet they do an important work. The healthiest trees and plants grow best where the earthworms thrive. And bad bugs don't like to eat a healthy plant. And our food is healthier because of the work earthworms do. So a farmer's tip is to feed, water, and take care of the earthworms, and they'll feed your plants. A farmer planted a peach tree in fertile soil. Underneath the peach tree there lived a big earthworm, called a night crawler. It went through the soil by digging tunnels, and then using those tunnels to travel. It came up, usually at night and sometimes on wet rainy days, to eat the rotting leaves laying on top of the ground. It helped recycle the leaves by eating them and then turning them into castings to fertilize the soil. It went deep into the ground if the weather above was too hot or too cold. Now the peach tree grew fast. Every Spring, it woke up. It had to bloom, grow leaves and bigger branches, and finally when it was old enough, have fruit by Summer. Else the farmer might chop it down. Then in the Fall when it got colder, its leaves would change color and fall onto the ground. It was dormant all Winter long. As the peach tree grew, it found out how difficult it was to grow its roots directly into the hard dirt. It looked for an easier way. So it began to grow its roots into the tunnels the night crawler had made. As the tree grew, its roots also grew, and soon the night crawler's tunnels were plugged shut. The night crawler could not come up for food. So, in order to stay alive and keep from starving, it had to dig more tunnels. It did not like to do this, because, night crawlers are sort of lazy. 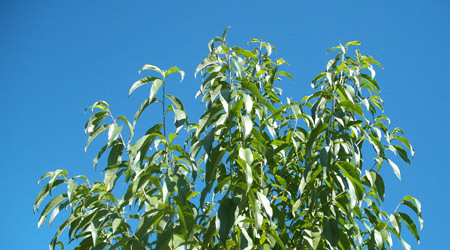 And the peach tree didn't like shedding its leaves each Fall just before the cold Winter. They were both helping each other, and by doing this, they were actually helping themselves. The peach tree had to shed its leaves which the earthworm ate and the earthworm's castings fed the peach tree. And the earthworm had to dig more tunnels which allowed the peach tree to grow bigger so that in the Fall there were plenty of good leaves (and maybe a peach or two that the farmer missed) for the earthworm to eat. © Copyright -- All rights reserved. Did you like this inspirational short story? You may share it with others provided you follow the Story Terms and Conditions. Maybe, you can't live very long without eating ??? While true, that's actually not really the moral of this peach 'n worm story. You and I sometimes have to do stuff that isn't easy. Maybe it's our job. Or the work we have to do. Maybe it's the days we get up on the wrong side of the bed. Maybe that's been happening more often than not. Maybe, it's every day. These things happen. Now we can go around griping and complaining, or we can find something to be grateful for. Maybe we can't see it, just like the peach tree and the earth worm couldn't see the whole picture to figure it out. But eventually, if we want it, we will get the wisdom to see that everything works out for good. When tough times come, we can either become bitter, or better. Sometimes we have unpleasant work to do. What sweetens it is a good attitude. Especially, an attitude of gratitude. There are some jobs no one likes to do. Those who just go in and do it, show themselves leaders. Each of us have roadblocks, a certain skill to learn, maybe it's really easy for others, but it's the one skill that's keeping us back from success in life or business. What's more important than making excuses or putting it off - which can end up quite painful - is to just go in and learn it and get messy and dirty and get the job done and over with. Once we do that, that same job, and other jobs like it, become a whole lot easier to do. It becomes a good habit. And, if you have a good attitude about it, you will often discover easier ways to get it done. Sometimes it's hard to find reasons to be thankful when something's tough to do. But eventually, we can find some good reasons. Even if it takes a long time! Even years later, at some point we will look back and see how it turned out for our good. And maybe, even laugh about it as we tell our children and grandchildren and friends. The tree and the night crawler couldn't see each others world. Many people don't see the hours of work involved behind a finished product. But God sees. By faithfully working, we are developing the amazing gifts and talents God has given us. Often this takes a lot of diligence and discipline. And if we do it our of love of God and our neighbor, we will receive a reward. Go to Stories about Gratitude.